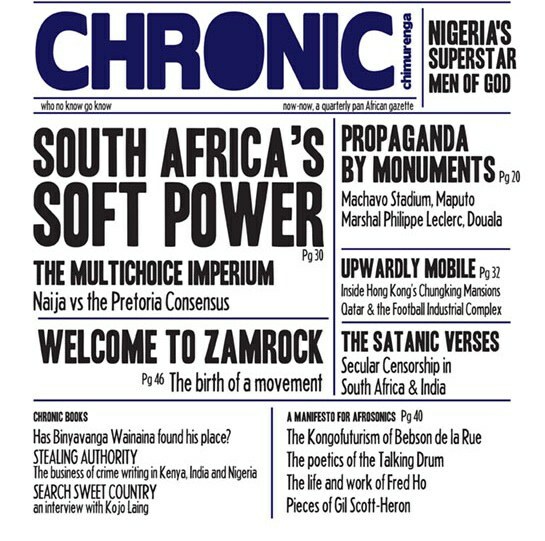 'Chimurenga Chronic,' is a new quarterly Pan-African gazette featuring new voices in the latest art, opinion, photography and African news. Writing about Africa has always been a fraught business. When we tell stories about the continent, Booker Prize-winner Hilary Mantel once observed, “we can’t speak without an imported frame of reference, carving up the years into the pre-colonial, post-colonial era: once upon a time in the golden age, once upon a time the dark ages that followed.” In each case the story of our everyday lives is curtailed towards simplicity and this in an issue the Chronic, a Pan-African quarterly gazette published by Chimurenga, seeks to rectify. In his lucid essay for the Rhodes Journalism Review, ‘Diagnosing the Chimurenga Chronic,’ Cameroonian founder and editor Ntone Edjabe begins by asking the following questions: “In which ways do people live their lives with joy and creativity and beauty, sometimes amidst suffering and violence, and sometimes perpendicular to it? How do people fashion routines and make sense of the world in the face of the temporariness or volatility that defines so many of the arrangements of social existence here?” To be sure these are pertinent questions, the Chronic goes to some length to try and provide answers by employing a range of writing (reportage, memoir, essays, interviews) and visual (photography, illustrations) techniques. Stacy Hardy (‘A brief history of monuments’) and Dominique Malaquais (‘Monumental failures’) write on the subject of monuments and how they fix contested histories in stone. In a no holds barred interview Jean-Pierre Bekolo Obama, the renegade Cameroonian filmmaker, advocates for the re-colonisation of his home country: “let’s face it: we’re in over our heads. We need the white folks to come back.” Elsewhere, Yemisi Ogbe writes a personal essay on ‘Nigeria’s superstar men of God’ and Paula Akugizibwe travels back in time to the 1970s in search of the sound which has taken over the Zambian Copperbelt: zamrock. Far reaching in scope, the articles featured range from analysing systems of governance to investigating the business of crime writing in Nigeria, Kenya and India. “We have to write the everyday, every day” Edjabe concludes his essay and that perhaps, is the singular theme which threads through the Chronic. Print copies of the Chronic are available here.